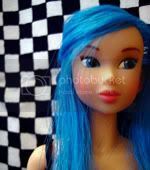 A forum for Momoko doll enthusiasts! Board index » Hello! » World Wide Momoko! This weekend I took a short day trip with my partner Michael (I forgot to bring along a Momoko) but I thought I'd share anyway, some photos I took. I live in the central part of the city of San Diego, about 10 miles inland from the Pacific coast. Our weather is temperate and mild year-round. It doesn't freeze in the winter where I live. However, the climate changes drastically as you go up in elevation, inland into the local mountains. "Julian" is a small pioneer town that was once lively with a productive goldmine. Once the gold-rush came and went, the town was all but forgotten. Now it's a quaint tourist resort with bed & breakfast inns, historic buildings, antique shopping, and lots of stores selling crafts & hand-made goods. They are famous locally for their quality apples (something about the soil and elevation) and the Julian Apple Pie company. We love to go every year before Christmas to finish our holiday shopping (it's sort of become a tradition for us). This year was a very special treat because we heard on the news that they has gotten a ton of snow dumped by an early snowstorm. I can't tell you how unusual it is to see a scene like this snowy field in Southern California! This horse was so beautiful and he just came right up to Michael! We had a great time! Julian was really busy but we got all of our shopping done and had lunch at a nice old-fashioned "soda shop" there. It was fun to see kids all so excited about the snow - throwing snowballs, running with their sleds and toboggans to a sledding hill. I wanted to take more pictures but my dumb digital camera doesn't allow me to take very many (memory ran out)! This picture is from last year -- we saw no snow then. Click for my BlackieGracie eBay store! Thank you for sharing your peaceful wintery pictures. The world is upside down nowadays. You have more snow than I have here a bit south of Stockholm in Sweden. I have no snow at all! A Merry Christmas and a Happy New Year to you and Michael! LOL! That's exactly what my Mom said when she saw the pictures! Thank you Anders! Wishing you a lovely Christmas as well! I hope you will get a little bit of snow at least for a "White Christmas." May Santa grant all of your wishes! OMG, you live right near me. I also live in San Diego -- Mira Mesa area. Next time you go, make sure you get a pie at Mom's -- they make 'em the best! (: I love their apple pie with the crumb topping. Whoah how cool is that. Makes me want to visit San Diego even more now. I want to visit sometime! Cool pics! I love Julian's hair! The horse is more than likely an Appaloosa- the markings on it's hindend are called a blanket. I love the odd coloured eyes! Weird seeing snow in the pics! Oh! You live so close! I used to go to the Toys R Us in Mira Mesa before they closed it. I have a friend that lives near there. It would be fun to meet you! I've wanted to stay at the Julian Hotel. It's so beautiful and going inside is like going back in time. Maybe Michael and I should go on our 10-year anniversary next year! We got a dozen of the Julian Pie Company apple pies to give out for Christmas. The crumb top ones are the best! San Diego is very diverse in landscape and climate. You gan go from the beach to mountains or dessert terrain in about 20 minutes! I'd like to visit Monterey sometime too! Michael's was born there while his dad was stationed at a military base there. Call me if you do! I didn't know that about the type of horse! He did have really beautiful eyes. That beautiful place Zoila, thanks for sharing these fantastic photos! !